Get started with some basic ‘must have’ supplies! Packing Paper Wrap fragile items & create crunched paper cushioning below and on top of contents. Wrap items kiddie corner in the paper for best results. Make sure that the entire object is covered. Use more than one piece of paper when needed. Cell Dividers Place cell divider snug in box to keep from shifting. Use to safely pack your stemware, glasses, delicate figurines, vases, etc. Dividers cost less and are more effective than bubble wrap or foam sleves when used properly. Items should never poke-out above the top of the cell. Stack cells into a deep box for taller items. Short glasses can be stacked if wrapped properly in packing paper. Label the box as ‘FRAGILE’ clearly on at least 2 sides. 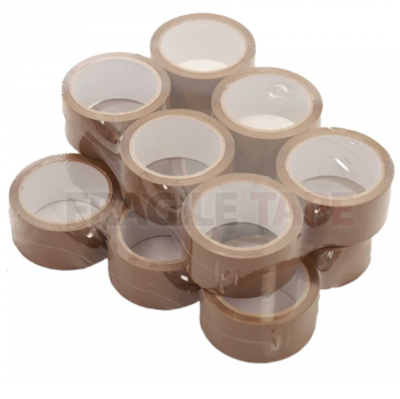 Packing Tape Professional ‘brown gummed’ packing tape is a must to secure bottom and top of boxes. Don’t be fooled – clear packing tape is NOT as effective and costs more! We like tape guns, if easy to use they can really speed things up! Thick Black Marker Clearly label all boxes by room & contents on at least 2 sides. It is IMPORTANT to LABEL BOXES ON THEIR SIDES & NOT ON TOP. Labeling tops does not allow for easy identification when stacked on a dolly and thus takes movers longer to identify on-the-fly and place correctly in your home. 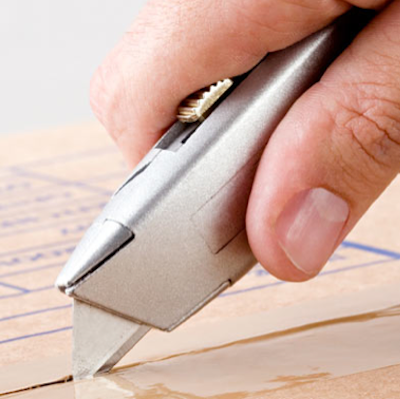 Box Cutter Cut tape and boxes A box cutter is much easier to use than scissors, but should be handled with care. 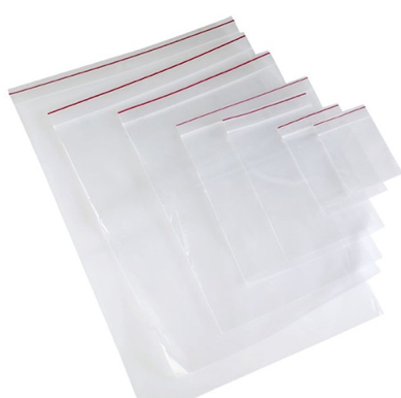 Small Medium & Large Recloseable Plastic Baggies Organize cords, hardware. Seal in bottled liquids. Collect small items in groups. Put anything in a baggie that you feel may leak in the box. For small hardware & parts label the baggies with your black marker for easy identification during set-up at your new home. Follow these basic guidelines for organized stress-free packing experience! Mark all boxes ON THE SIDE. List ‘Room & Contents’ for viewing while stacked. Do not pack boxes over 50 pounds. Lighter, smaller boxes are safer to move. Rule of thumb -The heavier the item the smaller the box. Make sure cartons are packed to the top and do not rattle, fill empty space with crunched packing paper. Pack one room at a time. Avoid “mixing” items from different rooms. Remove all open food, toiletries and chemicals. Discard or plan on transporting separately. Never pack flammable or prohibited items. Completely wrap and cushion small appliances (usually medium boxes work best). “Bundle wrap” and cushion small utensils, paying close attention to sharp objects such as knives. Always pack heavier items on the bottom and use strong, sturdy cartons. An arrangement of artificial flowers should be packed in its own carton. Wrap carefully in plastic wrap, tissue paper or paper towels. If possible, fasten the base of the floral piece to the bottom of the carton. Label the carton “FRAGILE – THIS SIDE UP”. Remove briquettes and transport separately. Grates, utensils, and all other moving parts should be wrapped and placed in a carton. Propane tanks will not be transported by moving company. Pack on binding edge in a 1.5 cube ft. carton or “book box”. Alternate spine and place paper in between books to avoid sticking. Do not overload and use a carton with closing lids. Wrap each bowl individually while nesting similar sizes together. Place these (groups) on edge inside the carton. Wrap lids individually and turn handle upside down on top of the bowl. Cream pitchers and sauce containers are wrapped similarly and are packed in “layers”. Continue layering, filling in empty spaces and always wrap heavier items on the bottom. Canned goods are always packed upright in a 1.5 cube ft carton, limiting to 30 cans per carton. Glass containers are wrapped individually and placed with boxed foods. Keep these items to the smallest carton necessary. Do not pack perishable or opened food. Cars & motorcycles shipped on a moving van need to be prepped properly. They should be drained, nearly empty of fuel and oil. Batteries should be disconnected. Stuff glasses and stemware with crumpled tissue or packing paper before wrapping. Lie on the corner of packing paper and roll it one or two full rotations (depending on size); pull sides of packing paper up and over glass/stemware and continue rolling to the far corner. Corrugated paper rolls or cellular boxes may be used for added protection. No matter what you’re packing, you should use crumpled packing paper in between each layer to assure a snug fit wherever there’s a gap. All boxes with “fragile” items should be marked accordingly. Wrap all pieces of china and glassware individually in clean paper. Using several sheets of paper, start from the corner, wrapping diagonally and continuously tucking in overlapping edges. A double layer of newspaper serves well as an outer wrapping. A generous amount of paper padding and cushioning is required for all china and glassware. Label cartons – “FRAGILE – THIS SIDE UP”. Small clocks should be wrapped and packed standing upright; hands should be removed (if applicable), or secured, if not protected by outer shell. Grandfather clocks have many moving parts and should be prepared by a certified serviceman. Pendulum and weights need to be removed. Hanging clothes may be placed inside of wardrobe cartons (available from Magic Moving & Storage) If not, each garment can be folded and placed in carton. Lightweight clothes and undergarments may be left inside bureau drawers. 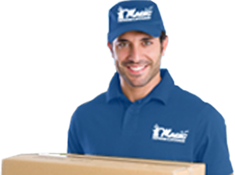 Hats can be left in hat box or placed in carton, labeled “fragile” on the side and top. Footwear may be left in shoe boxes and packed in large cartons. Heels and other structured shoes should be wrapped and cushioned accordingly. Center one plate on top of neatly stacked packing paper. Pull one corner of several sheets over the plate until completely covered. Stack another plate on top, pulling second corner of sheets over second plate. Stack a third plate pulling corners once again, over the third plate. Re-wrap the entire bundle and place bundle inside carton, standing on edge. Repeat process until layer is completed inside carton. (Dish pack). Hang curtains and draperies over crossbars in clothing wardrobes. Otherwise, remove curtains from rods, fold them lengthwise and pack in cartons. Firearms must be emptied of all ammunition. Serial numbers must be registered on specialized inventory list. Magic Moving & Storage does not transport any flammables or combustibles. These items must not be packed. They can cause damage to your shipment and to others. Magic Moving & Storage does not transport frozen items. They are perishable in nature and will not move well. We suggest packing frozen food in coolers and transporting yourself. It is best to consult with your moving company about custom-made cartons and crates for items of this kind. Disassemble harps and shades and handle lamp shades by their wire frames only. Place lampshade upright in clean tissue-lined carton. Surround shade with protective paper. Shades can be nested together as long as they are separated by paper. The harp and decorative knob can be wrapped in packing paper and taped to the bottom of carton. The lamp base should be wrapped in brown overseas packing blankets and packed in special lamp cartons. (Can be provided by our company). Neatly fold blankets, sheets, tablecloths, and towels and pack in clean carton. Special mattress cartons are available from our moving company. We recommend that you carry all medications with you. Some prescription drugs can lose their potency if exposed to heat. If you must pack, tape or otherwise seal the caps and pack upright in small cartons. Remove and wrap all loose articles inside the oven. This includes glass shelves, carousels, and any cookware. “Cushion” the bottom of the carton and place wrapped/padded microwave inside carton. Add cushion on top and seal tightly. * Bubble-wrap is good for such device. Wrap pictures, paintings, mirrors and frames with paper pads (ask your mover) and place on edge in specialized mirror cartons. Larger paintings and mirrors can be placed in “telescoping” cartons. * Never lay flat! Computers should be packed in their original cartons, when available. Otherwise follow steps outlined in “Stereos and other electronics”. You should bag and wrap any computer accessories and label accordingly. Follow instructions regarding your “hard drive”. Diskettes can be wrapped in tissue paper. Do not pack any magnetized items such as batteries, radios, etc. with your diskettes. Data can be erased. Note: We recommend you make backup copies. Plants are delicate and can get damaged or wilted. We also suggest moving these in your personal vehicle. Records without sleeves should be wrapped individually to prevent scratching. Pack records and CD’s on their edge. Place in small carton with crushed paper lining the bottom. Cassette tapes should remain in their protective cases, otherwise wrap individually. Roll up rugs and linoleum and secure on both ends. Loose silverware should be wrapped individually or in sets. If silverware is in chest, you might wish to wrap individually and reposition them in the chest. Air causes silver to tarnish so fill in empty spaces with tissue paper. Statues and large vases should be wrapped with paper pads just like lamp bases. Statues may have thin arms or other décor. Wrap gently and cushion around these areas so as to absorb shock. Line bottom and top of carton with crushed paper. Always pack electronics in their original cartons when available. Start by padding bottom of carton with crushed packing material. Wrap device with paper pads, tape securely and place in carton. Add crushed paper, firmly seal carton, and label “fragile-top load”. NOTE: Secure any moving parts such as “arm” on phonograph. Televisions may require specialized boxes for this purpose. Flat screens, LCD’s and Plasma TV’s should be separated from their base and packed accordingly. Small hand tools can be wrapped individually and packed in small cartons. Large tools such as rakes and other garden tools can be blanket-wrapped individually with paper pads or blankets. (Ask your mover). Any power tools should be drained of fuel & oil; electronic cords tightly wrapped. Place videos on edge in small carton. When stacking, layer with paper in between to protect from scratching. Fill in around edges with crumpled paper to secure.